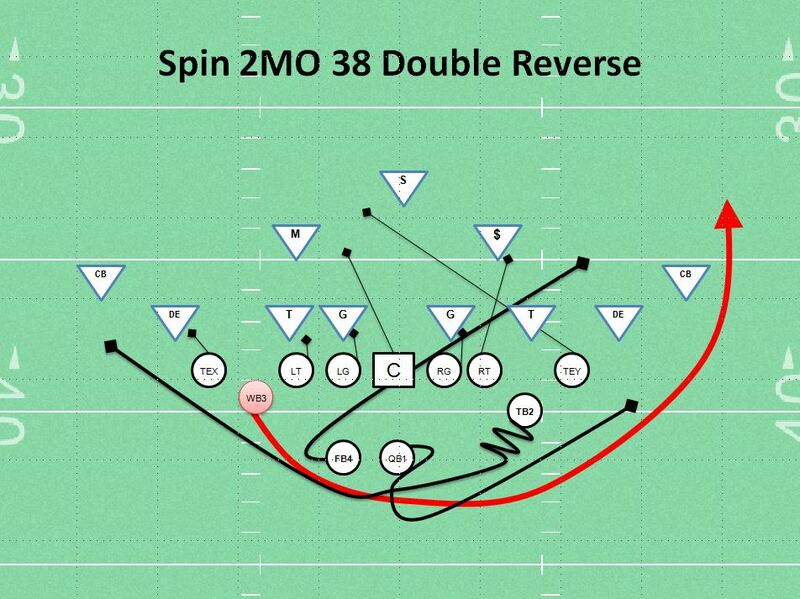 The Spin 2MO 38 Double Reverse Play was my favorite play when I coached in Aravda, Colorado a suburb of Denver near Golden CO. My Aravada Pirate team had a top Running Back in the league, 2 great fullbacks, and a very smart tall QB with a decent arm and ok speed. Every time we ran this reverse play we averaged 15+ yards a carry. I will say a majority of the yards were due to the RBs abilities but a pursuit happy defense will make this play work all day long. This play is #4 on my Best Offensive Plays in Youth Football list. It would be the #1 play on my list if it didn’t require a top 3 RB in your league. You must have a fast TB or WB as the reversing back to run this play. This play works great after several sweeps to one side and then reverse back on the defense. You want to set up the defense flowing one direction for three or four plays then hit them with the reverse. Especially if the DEs are crashing hard and the CBs are playing back and also bailing on contain. In the above diagram, my fast running back is the #3WB. The play starts out like a Spin 2MO 27 Sweep. QB receives the snaps spins toward the motion back, pitches or hands off to the 2 back and instead of spinning into the LOS he boots to block the DE or CB. The FB counter jabs playside then hits middle of LOS trying to log block the playside LB. The O-Line blocks Gap on Linebacker or GOL. The WB will jab step forward then run a deep sweep lane behind the 2 back sweeping with the ball and receive the ball via pitch / east toss from the 2 back behind the backside OT/OG. The longer you can wait on the second exchange the better because the defense will flow with the ball. The WB will run the sweep wide to the numbers unless the DE has gained to much ground which he will then cut underneath the DE and look for open field and goal line. Usually the reverse back must beat the CB and if he does its a TD. If you have average speed then you can also run the counter out of the formation above. The QB will spin back with the ball and hand off to the WB underneath to hit the 6 hole. The Spin offense is not for everyone. You must have all the pieces in place; Center, QB, TB, FB and a decent WB. Your biggest challenge is finding a fast TB / WB that is a jitterbug. If you have a RB such as this then the Spin Offense works great. What do you think about the Spin Reverse? Do you run reverse and misdirection much? Let me know what you think? I would love to hear from you. Leave me a comment or email me.